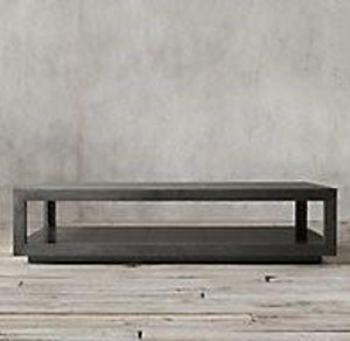 Restoration Hardware (RH) of Corte Madera, Calif., is recalling 1,524 metal-wrapped coffee tables. The firm has received reports of elevated blood lead levels in two children in two separate homes where the recalled coffee table was present. This recall involves RH Annecy and La Salle metal-wrapped coffee tables. The recalled coffee tables are rectangular with thin sheets of dark-colored metal wrapped around the frame to form the outside of the coffee table. If the table does not have a green sticker contact RH to determine if the table is part of the recall. The tables, manufactured in India, were sold at RH Galleries and outlet stores nationwide and online at restorationhardware.com from August 2013, through December 2017, for between $1,900 and $2,600. Consumers should immediately stop using the recalled coffee tables, cover them, and place them out of the reach of children. Consumers can contact RH to receive a full refund or a free replacement table. RH is contacting all known purchasers directly. Consumers may contact Restoration Hardware toll-free at (888) 728-8419 from 8 a.m. to 5 p.m. (PT) Monday through Friday, by email at recall@rh.com, or online at www.restorationhardware.com and click on Safety Recalls at the bottom of the page for more information.